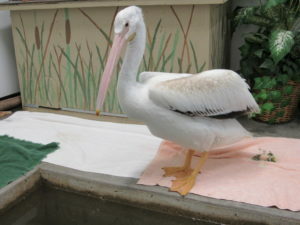 The White Pelican patient was brought in to WINC around Thanksgiving emaciated and filled with parasites. He is now doing well and all done with rehabilitation process. We were able to treat his parasites and help him get back up to normal weight with his breakfast and dinners of live fish! Through his rehabilitation we discovered he had an old injury in his left elbow that had already started to develop arthritis. He has very limited range of motion in the joint due to the injury as well as arthritis and because of this he is not releasable. His arthritis will need to continue to be monitored and he will need to get medication to help with any discomfort in that elbow joint. This video shows our staff throwing him a fish with his pill of medication hidden in the fish, which he takes readily! 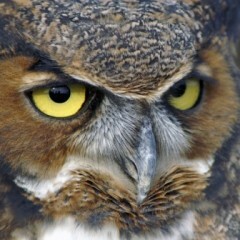 We began networking and looking for permanent placement for him at a zoo or sanctuary. We *hope* to place him at the El Paso Zoo in Texas. We already are in communication with the staff there, but we need U.S. Fish & Wildlife approval for placement. Unfortunately, with the current government shutdown, we will be housing the Pelican until we can get approval for his placement and get him transferred. So we need help feeding him, as having to feed a piscivore (fish eater) is not cheap. The pelican eats about $20-30 a day worth of live fish. If you are or you know a local fisherman that would be willing to give donations of live or whole frozen fish (no longer than 12″) we can use that in combination with purchased live fish, which would be wonderful. OR you can donate money to us directly to purchase live fish (this is the better option versus buying them yourself, since we can get a nonprofit discount).